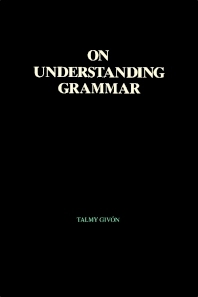 On Understanding Grammar covers the interdependencies among the various aspects of linguistics and the human language. This eight-chapter text considers some pertinent topics in linguistics, such as discourse-pragmatics, diachronic syntax, topology, creology, method, and ontology. Chapter 1 describes the notions of fact, theory, and explanation, particularly about how these notions manifest themselves in actual practice. Chapter 2 redefines syntax in terms of communicative function and discourse-pragmatics, and about the relation between the function of grammatical devices and their formal properties. Chapter 3 deals with discourse-pragmatics and how it transcends the narrow bounds of deductive logic, as well as the function and ontology of negation in language, and how those relate to the fundamental information-theoretic principle of figure versus ground. Chapter 4 explores the two major aspects of case systems, namely, the semantic role and pragmatic function, and how the two interact in determining the typological characteristics of grammars. Chapter 5 examines the relation between discourse and syntax based on diachronic, ontogenetic, phylogenetic viewpoints. Chapter 6 tackles the relation between synchronic grammar and diachronic change, while Chapter 7 describes the relationship between human language and its phylogenetic evolution. Chapter 8 is about language and ontology, as well as the relation between cognition and the universe. This book will prove useful to linguistics and language researchers.